Experience sacred American Indian traditions and view authentic cultural displays at top Native American museums, cultural centers and attractions in Oklahoma. 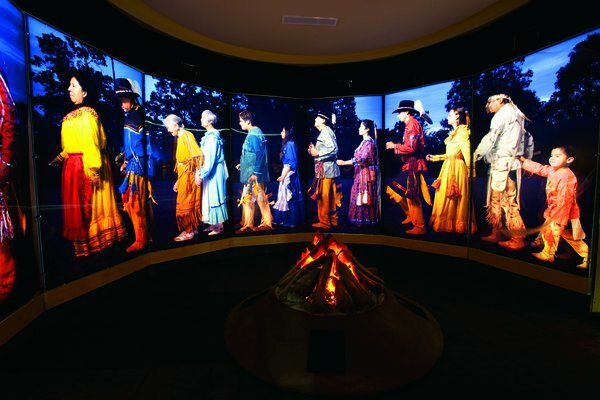 The Stomp Dance Gallery of the Chickasaw Cultural Center in Sulphur features holograms and a glowing campfire to simulate the age-old tradition of the sacred stomp dance. A total of 67 Native American nations have called Oklahoma home. Here, discover the deeply held traditions and collective spirit of Native Americans in a way you won’t find anywhere else. Feel the heart-stopping power of a traditional tribal dance to a drum beat at a sacred powwow. Be swept away by the intricate details of colorful regalia at a parade and experience the deep peace and reverence of the earliest Oklahomans with a visit to one of many historical sites and centers that celebrate their rich tribal heritage. Nestled in the foothills of Oklahoma’s Ozark Mountains in Tahlequah, the Cherokee Heritage Center conveys the detailed history and vibrant heritage of the Cherokee people, as well as their time in Oklahoma. Experience how the Cherokee people lived by touring the numerous displays scattered throughout 44 wooded acres, including the Diligwa 1710 Cherokee Village. Much more than a traditional museum exhibit, the Diligwa 1710 Cherokee Village displays Cherokee life before European contact through a tour of ancient structures and demonstrations of early cultural practices such as basketry, flint knapping and Cherokee stickball. Inside the heritage center, feel the pain of the Trail of Tears by touring an exhibit featuring life-size sculptures depicting the emotional forced removal of the Cherokees from their indigenous territory. Immerse yourself in Chickasaw civilization from the tribe’s pre-Oklahoma existence through the triumphs of the tribe today at the Chickasaw Cultural Center in Sulphur. This grand cultural center, which sits on more than 100 acres of Chickasaw land in south-central Oklahoma, allows visitors to see, feel and even taste the heritage of the Chickasaw tribe through interactive exhibits, botanical displays and traditional dwellings. Walk through the powerful Removal Corridor to view the painful journey that brought the Chickasaws to Oklahoma and feel as though you’re traversing the bleak winter landscape yourself. While at the center, join the inner circle of a long-practiced stomp dance and get a taste of true Chickasaw culture at the Aaimpa’ Café, where traditional fare such as grape dumplings, Indian fry bread and pashofa (a corn soup) are served. Join the 300,000 people who visit downtown Oklahoma City’s Red Earth Art Center annually and experience Native American history in an innovative and unique way. Feel the sacred traditions and collective spirit of American Indians with more than 1,400 pieces of art that portray the history of various tribes, as well as their unique cultural diversity through paintings, carvings, pottery and revolving exhibitions. Visit the Red Earth Art Center in the height of June and witness the city’s, if not the country’s, greatest display of American Indian visual and performing arts at the Red Earth Native American Cultural Festival. Watch a celebratory parade of tribal spirit as representatives of more than 100 tribes overtake the streets of Oklahoma City in native regalia. Don’t miss the festival’s heart stopping Grand Entry, when dancers in tribal dress compete to the powerful beat of drums, and stick around for the juried art show and market. Sequoyah, the famous Cherokee silversmith who developed the written alphabet for the Cherokee language, is memorialized on Oklahoma soil at Sequoyah’s Cabin in Sallisaw. Tour this one-room cabin, which Sequoyah built in 1829, and transport yourself to the days when Sequoyah worked to increase literacy within the Cherokee Nation. Learn the basics of Sequoyah’s working syllabary at the museum, where other Cherokee artifacts are also on display, and reflect on Sequoyah’s great accomplishment and contribution to Oklahoma heritage as you roam the very grounds Sequoyah once walked within the 10-acre park surrounding the cabin. The famous Gilcrease Museum in Tulsa, home to one of the world’s most comprehensive collections of American Indian and Western art, showcases Oklahoma’s one-of-a-kind American Indian history in a way that honors tribal culture through the preservation of anthropological finds and renowned artwork. Located on 475 sprawling acres protected by native grasses, the museum features everything from Navajo rugs and detailed jewelry, to breathtaking beadwork and intricate pottery. Feel the spirit of Oklahoma’s American Indian tribes through artwork created for beauty and function, and pause to reflect on these art pieces that serve as dynamic catalysts for both tribal unity and appreciation. Step into the Five Civilized Tribes Museum in Muskogee and you will be standing on a piece of sacred American Indian history. While the museum is packed with one-of-a-kind art and artifacts celebrating Native American life, the building itself plays a significant role in the history of the tribes. As the first Union Indian Agency building to house the Superintendence of the Five Civilized Tribes (Cherokee, Chickasaw, Choctaw, Muscogee Creek and Seminole), this museum is uniquely able to convey the rich culture and heritage of the tribes. Visitors are invited to view breathtaking artifacts, paintings and sculptures that depict the American Indian journey that has been both painstaking and celebratory. Standing Bear may have been a chief of the Ponca tribe, but the towering statue erected in his honor in Ponca City stands as a tribute to every Native American. Famous for his landmark speech before a U.S. District Court in 1879 stating that all American Indians regardless of tribe deserved the same recognition and protection under the law as white men, Standing Bear paved the way for native rights in this country. Standing two stories high and made of bronze, this larger-than-life representation of the chief at Standing Bear Park captures his spirit of compassion and zeal. After viewing the statue of Standing Bear, take a moment to stroll along the on-site walking trails and consider the incredible legacy of the six area Native American tribes: Osage, Pawnee, Otoe-Missouria, Kaw, Tonkawa and Ponca. Don’t miss the renowned Standing Bear Powwow, held each year in September, to witness as representatives from these six tribes gather for intertribal dancing, powerful singing and lively drumming within the park.